I have a new piece at Inside Higher Ed today, on teaching with collaborative digital textbooks like this one. Oxford, Bodleian Library, MS Douce 368 (mid or late twelfth c.) contains one of eight complete surviving copies of the Vita et miracula Sancti Kenelmi (1066–1075). The Vita is the earliest substantial account of the career of Kenelm, whose story would go on to feature in the South English Legendary and later English and Anglo-Latin texts. The narrative recounts Kenelm’s premonitory vision, decapitation, surreptitious burial, and posthumous rediscovery. In the climactic scene, the location of the saint’s murdered body is divulged to the pope in Rome by a dove carrying in its beak ‘a snow-white parchment inscribed with golden letters in English’ (‘niueam menbranam aureis litteris anglice inscriptam’, §10). In Douce 368 and other early manuscripts of the Vita, the English inscription is reported as a rhyming Latin couplet. However, three thirteenth- and fourteenth-century manuscripts gloss the passage with an English alliterative couplet: ‘In Klent Koubeche | Kenelm kunebearn/ liy under yorne | heaved bereved’ (‘In Clent Cow-valley, Kenelm the royal scion lies under a thorn-bush, decapitated’). The English alliterative couplet survives elsewhere in a free-standing late twelfth-century copy. An early eleventh-century application of the epithet cynebearn to Kenelm suggests that the alliterative poem predates the Vita. Like Cædmon’s Hymn, another miraculous English poetic utterance, the alliterative snippet on Kenelm seems to have moved from memory (in the earliest manuscripts) to the margins (in later manuscripts) and finally to the main text (in later redactions of the legend). 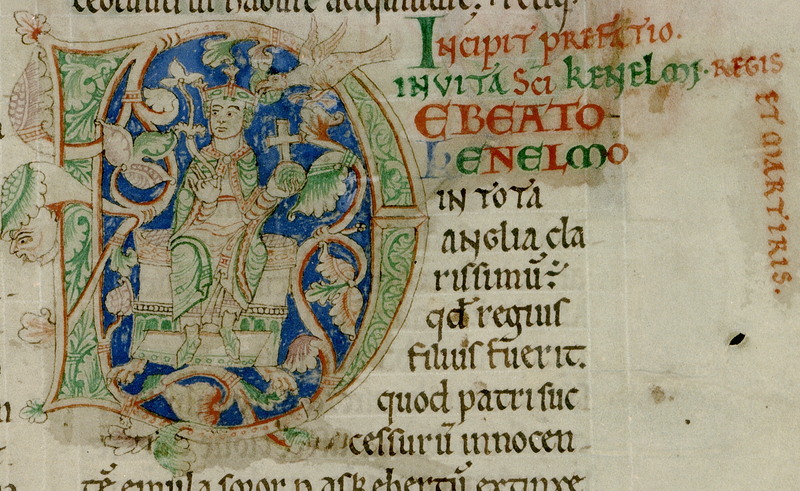 The Douce 368 text of the Vita opens on folio 80r with a historiated initial D depicting a resplendent Kenelm crowned and enthroned, a globus cruciger in one hand and a lily in the other. A dove with wings spread and beak open occupies the upper right corner of the illustration, over Kenelm’s shoulder. To the extent that they take notice of such details, scholars offer contradictory interpretations of the function of the dove. A note in a modern hand in the manuscript describes ‘the dove bringing the narrative of his murder’, evidently mistaking Kenelm for the Pope. F. W. Potto Hicks remarks only that ‘the dove refers to the legend of the letter announcing his death being carried to Rome’. Miriam Gill offers, ‘a bird to the right of his head must refer either to his premonitionary dream or to the dove which brought the news of his death to the Pope’. Rosalind Love, in a thorough description of the manuscript, has Kenelm ‘attended by a bird bearing something in its beak—perhaps the letter delivered to the pope in Rome’. Judith Collard sees the dove ‘touching his crown’. The opening of the Vita et miracula Sancti Kenelmi in Oxford, Bodleian Library, MS Douce 368 (mid or late twelfth c.). St. Kenelm, enthroned, holds orb and lily; a dove places a crown on his head.